Have Fun, But Swim Safe. Let's make sure that our pools both fun AND safe. It's a very tough line to draw, however, between the two. You want your guests to exercise, cool off and enjoy themselves. But, real dangers exist. A gate can be left open. A dive can be made into shallow water. Broken glass can find it's way to the pool bottom. And, for me, most frightenning of all... children can foolishly start a breath holding contest. Each year over 350 children, under the age of five, drown. Studies prove that most of these deaths occurred when an adult was nearby, but not vigilant. Drowning is the forth leading cause of accidental death in the US for all ages. You can drown - even after you have left the pool. Over 50% of pool accidents ocucr in water that is 4' deep or less. Studies have shown that for every 10 diving accidents, 8 occurred in pools with no warning signs. 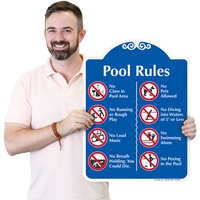 Pool signs are a critical part of your protecton. Pools need many layers of protection - a lifeguard or supervision, fencing, alarms, good lighting, emergency phones... plus, signs. Good signs show that you take your responsibility for pool safety seriously. Good signs also cannot be ignored. 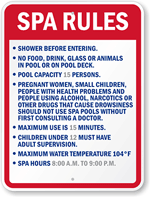 No guest, for example, caught swimming after hours, should be able to give the excuse "I never saw your sign". A child can die in the time it takes to answer a phone call. Many of our designs use symbols and easy to understand language. Don't make it easy to ignore the warning. 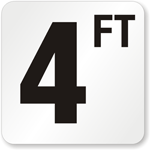 We make it easy to customize your own rules - to fit your own level of supervision or to meet your local rules. A personalized sign is usually the one that gets read most closely. We also understand that pools are also our backyards. Pool signs don't have to be garish - they need to be visible and easy to understand, yet also fit into your pool landscaping and design. We offer a cohesive set of designs that are meant to be used in groups or in a series. Color schemes can be changed to match your decor. Sometimes, it's the small things that make your pool safe. Keep glass out of pool areas. Issue a pool pass that is easy to wear and keeps freeloaders out. Tell guests not to use a pool ring as a toy. Don't let roughhousing by teenagers shove a toddler over the edge. Shower before you go into the pool or spa. 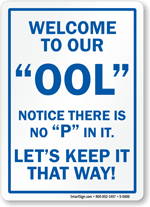 Pool etiquette signs create a respectful environment for all of us. MyPoolSigns is a part of the SmartSign family of sign sites. We have been manufacturing and selling safety signs for over 30 years and this site is another example of how much we care about your safety at home. Pools are about community and family. They are where we spend our weekends and our time together as a family or as a community. Please let us help you make swimming both fun AND safe!